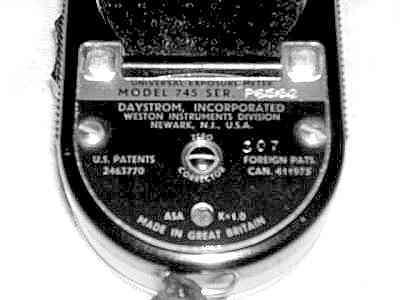 The fourth of the Weston Master series, this meter was being produced in 1960 in Enfield, Middlesex for the US and UK markets where for the latter it was also distributed by Ilford Ltd. It is a complete re-design, in an aluminium and plastic case, smaller and lighter than the Model III. It had greatly improved sensitivity, a better designed scale, a larger dial and a sliding needle lock. A great example of British design and engineering. ASA speeds up to 1600, LVs 1-18, sopps f1-32 and speeds 64-1/1000 sec. The photos show UK model no S461-4 serial 004KK. I've had this from new, it works perfectly and always has. It is the most reliable and accurate piece of equipment I have ever come across and has been with me on hunderds of professional shoots. There is really no need to go to a V or Euromaster - they don't have anything over a IV. The instruction book text is here. In the US it was imported from the UK under the brand Daystrom Incorporated - Weston Instruments Division.